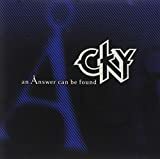 These are lyrics by Cky that we think are kind of repetitive. There's the whole song right there. Music is great, and the lyrics are meaningful, so I'm not complaining.